Eukaryotic ribosome assembly is tightly controlled by more than 200 assembly factors to ensure faithful protein synthesis (Thomson et al., 2013). During the initial stages of ribosome biogenesis, rRNAs, ribosomal proteins, and assembly factors associate into nucleolar pre-60S particles, which ultimately mature into functional large ribosomal subunits in the cytosol (Kressler et al., 2010). The AAA+ (ATPases Associated with various cellular Activities) family member Rea1 (or Midasin) consists of nearly 5000 amino acids and generates force to mechanically remove assembly factors. Rea1 pulls out the Ytm1 complex (Tang et al., 2008; Sahasranaman et al., 2011) to promote the transfer of pre-60S particles from the nucleolus to the nucleoplasm (Bassler et al., 2010) (Figure 1A). Rea1 also removes the assembly factor Rsa4 (Ulbrich et al., 2009), which triggers a signalling pathway that ultimately recruits RanGTP to pre-60S particles to export them to the cytosol (Ulbrich et al., 2009; Matsuo et al., 2014) (Figure 1A). Rea1-mediated Rsa4 removal might also indirectly remodel the important H89 rRNA helix of the peptidyltransferase centre into its correct position (Leidig et al., 2014; Bradatsch et al., 2012; Baßler et al., 2014). Despite its crucial importance for pre-60S particle maturation, the Rea1 structure and mechanism have remained largely enigmatic. Function and structure of Rea1. (A) Schematic representation of the reactions catalysed by Rea1. (B) Cartoon representation of the Rea1 structure showing the N-terminal domain, the AAA+ ring as well as the stem, middle and top domains of the linker. The top3 domain is an insertion of the top2 domain. The C-terminal D/E-rich region and the MIDAS domain of the tail are not visible as indicated by their transparent representation. (C) Front (left panel) and side view (right panel) of the Rea1 structure. The AAA2L-H2α insert occupies the central pore of the AAA+ ring. The linker region of the tail emerges at an angle of about 120° from the AAA +ring. (D) Colour-coded primary sequence representation of Rea1 domains. Rea1 consists of an N-terminal α-helical domain (NTD), a ring of six AAA+ domains, and the C-terminal tail (Ulbrich et al., 2009; Barrio-Garcia et al., 2016; Wu et al., 2016). The Rea1 tail is subdivided into an α-helical linker region, a D/E-rich region, and a MIDAS (Metal-Ion-Dependent Adhesion Site) domain which is responsible for the interaction with the Ytm1 and Rsa4 substrates (Bassler et al., 2010; Ulbrich et al., 2009; Kressler et al., 2012). Rea1-mediated Ytm1 and Rsa4 removal is ATP dependent (Bassler et al., 2010; Ulbrich et al., 2009). In analogy to other AAA+ family members, it has been proposed that ATP binding and hydrolysis in the AAA +ring is coupled with conformational changes within the Rea1 molecule that generate the force for assembly factor removal (Ulbrich et al., 2009; Kressler et al., 2012). Pioneering negative stain electron microscopy studies have revealed that the Rea1 tail can extend from the AAA+ ring but is also able to adopt AAA+ ring proximal conformations (Ulbrich et al., 2009). The latter tail conformations could bring the MIDAS domain close to its assembly factor substrates when Rea1 is bound to pre-60S particles (Ulbrich et al., 2009). It has been proposed that switching between these different tail conformations might produce the force for the removal of Ytm1 and Rsa4 assembly factors (Kressler et al., 2012). However, in the absence of high-resolution information, it is unclear what the structure of the Rea1 AAA+ engine looks like, what the molecular architecture of the tail is and how Rea1 binds to its substrates. 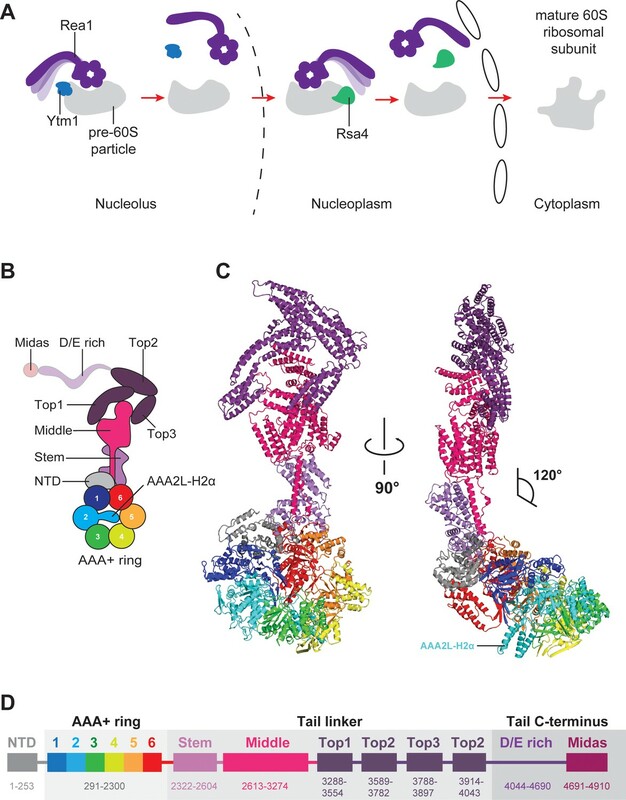 To provide insights into these open questions, we have determined the S. cerevisiae Rea1 structure in complex with ADP by CryoEM, which revealed the NTD, the AAA+ ring, as well as the linker part of the Rea1 tail (Figure 1B,C,D). Focused refinement of the NTD-AAA+ ring area and the linker resulted in two cryoEM maps with resolutions of 4.4 Å and 3.9 Å, respectively (Figure 1—figure supplement 1A–F, Figure 1—figure supplement 2 and Supplementary file 1). In the NTD-AAA+ ring map, the main-chain is well-resolved in the NTD, AAA1, AAA2, as well as AAA6, and side-chains are occasionally visible (Figure 1—figure supplement 2). The AAA3-AAA5 part of the AAA +ring is more flexible, but still allowed docking of AAA+ domains into the map (Figure 1—figure supplement 2). The Rea1 linker map revealed side-chains throughout (Figure 1—figure supplement 2). The D/E-rich region and the MIDAS domain that follows are not resolved. Mass spectrometry analysis indicates that these regions are present in purified Rea1 (Figure 1—figure supplement 3) suggesting their absence is due to the intrinsic flexibility of D/E-rich regions (Romero et al., 2001). The AAA+ ring domains, AAA1-AAA5, are each subdivided into an α/β large domain (AAAL), consisting of five α-helices and five β-strands (H0-H4, S1-S5), and a small domain (AAAS) made up of an α-helical bundle containing five α-helices (H5-H9) (Figure 1—figure supplement 4A,B). All AAALs have β-sheet inserts in H2 as well as in between H4 and S3. In the case of AAA2L, AAA4L, and AAA6L, the H2 β-sheet is extended by α-helical bundles (H2α) of which AAA2L-H2α and AAA4L-H2α are partially disordered (Figure 1—figure supplement 4A). Like in other AAA +machines, the Rea1 ring AAA+ domains are arranged as inter-domain modules. Each AAAL, except AAA1L, is tightly associated with the AAAS of the previous domain (Figure 1—figure supplement 5A). AAA1L would be expected to interact with AAA6S, but this domain is absent in Rea1 and its place is taken by the NTD. The nucleotide-binding sites of AAA+ proteins are located at the interfaces between neighbouring AAA+ modules, which carry the conserved Walker-A, Walker-B, and arginine finger motifs responsible for ATP binding and hydrolysis (Wendler et al., 2012) (Figure 1—figure supplement 5B,C). ATP binding brings these neighbouring modules into close contact to induce ATP hydrolysis. In Rea1, the AAA2, AAA3, AAA4, and AAA5 sites are functional, while AAA1 and AAA6 lack the Walker-B motif involved in ATP hydrolysis (Kawashima et al., 2016) (Figure 1—figure supplement 5D). In the structure presented here, the nucleotide binding sites of AAA1 and AAA6 are closed and show densities consistent with a bound nucleotide (Figure 1—figure supplement 5B and Figure 1—figure supplement 6A,B). We interpreted this bound nucleotide as ADP as there is not enough density to fit a γ-phosphate. In order to determine the degree of closure at the Rea1 AAA1 and AAA6 sites, we compared them with closed nucleotide binding sites in a crystal structure of the Rea1 related AAA+ family member dynein (Schmidt et al., 2015). In the dynein structure, the AAA1 site is trapped in the ATP-hydrolysis transition state due to the presence of ADP.vanadate. All catalytic residues of this site contact the nucleotide and have the right conformation to support hydrolysis, indicating that the site is completely closed (Schmidt et al., 2015). We also carried out a comparison with the dynein AAA3 site, which is bound to ADP and, although overall still closed, appears slightly more open than the AAA1 site. The comparison was done by analysing the distance between the H4 α-helix, which carries the arginine finger, and the closest phosphate group of the nucleotide bound to the Walker-A motif of the H1 α-helix (Figure 1—figure supplement 7A–D). This distance is around 8 Å in the case of the dynein AAA1 site and around 12 Å in the case of the dynein AAA3 site. The equivalent distances in the Rea1 AAA1 and AAA6 sites are around 10 Å and 8 Å, respectively. For the Rea1 AAA1 site, the degree of closure is intermediate between the completely closed dynein AAA1 site and the ‘less closed’ dynein AAA3 site. The Rea1 AAA6 appears to be already fully closed in the ADP state. In contrast to the AAA1 and AAA6 sites, the AAA2 and AAA5 nucleotide-binding sites of the Rea1 AAA+ ring are wide open as indicated by large gaps between modules AAA2/AAA3 and AAA5/AAA6 (Figure 2A,B,C). The open state of the latter sites is stabilised by the AAA2L-H2α insert which sits in the AAA+ ring centre. The β-sheet base of AAA2L-H2α is interacting with the AAA1L H2-β-sheet (Figure 2—figure supplement 1A) and the α-helices of AAA2L-H2α contact the tips of the AAA3L and AAA5L H2-β-sheets to prevent the closure of the AAA2 and AAA5 sites (Figure 2B,C and Figure 2—figure supplement 1A,B). 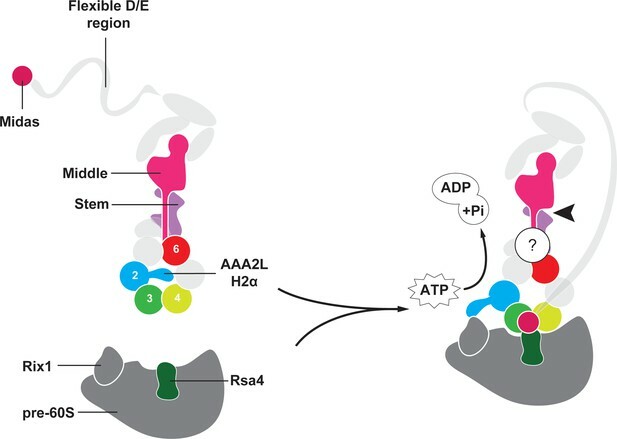 Rea1 AAA+ ring architecture and regulation of its ATPase activity. (A) Architecture of the Rea1 AAA+ ring. For clarity, only AAAL domains are shown. Gaps exits between AAA2L/AAA3L, AAA3L/AAA4L and AAA5L/AAA6L (black arrows) indicating that nucleotide binding sites AAA2, AAA3 and AAA5 are open. The cartoon in the upper box establishes the view with respect to Figure 1C left panel. (B) Open AAA2 and (C) open AAA5 nucleotide-binding sites. In both cases, contacts between AAA2L-H2α and the AAA3L or AAA5L H2 β-sheets prevent site closure. (D) AAA4L is rotated with respect to AAA5L (see main text). The rotation moves its ATP-binding H1 α-helix (red) away from the AAA5L H4 α-helix (purple), which carries the R-finger to support ATP-hydrolysis at the AAA4 nucleotide site. The distance is indicated by the black arrow. For clarity parts of AAA5L and AAA4L are not shown. (E) Open AAA3 nucleotide-binding site. The gap between AAA3L and AAA4L is stabilized by contacts between AAA2L-H2α and the H2 β-sheets of AAA3L and AAA4L. (F) ATPase rates for wild type Rea1 (WT) and the AAA6L-H2α (ΔAAA6L-H2α) as well as AAA2L-H2α (ΔAAA2L-H2α) deletion mutants. Deleting AAA6L-H2α decreases the Rea1 ATPase rate, while deleting AAA2L-H2α leads to a 10–15-fold increase in ATPase activity. AAA2L-H2α also contacts large parts of the AAA4L H2-β-sheet and enforces a rotation of this domain (Figure 2—figure supplement 1C and Figure 2—figure supplement 2A). As a consequence, AAA4L H1, which bears the ATP-binding Walker-A motif, moves away from AAA5L H4, which provides the arginine finger motif for ATP hydrolysis at the AAA4 site (Figure 2D and Figure 1—figure supplement 5C). Furthermore, the AAA2L-H2α interactions with the AAA4L and AAA3L H2-β-sheets also keep the AAA3 site in an open state (Figure 2A,E and Figure 2—figure supplement 1C). Our structural analysis suggests that the AAA2L-H2α insert impairs the hydrolytic activity of all functional Rea1 nucleotide binding sites. To provide additional evidence for its inhibitory role, we deleted AAA2L-H2α and determined the ATPase activity of the mutant. In support of our interpretation, the deletion of AAA2L-H2α increased the ATPase rate 10–15 fold compared to wildtype Rea1 (Figure 2F). The increase in ATPase activity was specific for the AAA2L-H2α deletion mutant as deleting the AAA6L-H2α insert did not lead to a drastic change in ATPase activity (Figure 2F). Rea1 and dynein form a special subclass within the AAA+ family. Most AAA+ members assemble individual AAA+ domains into hexameric rings. In contrast to this more common way of AAA+ ring formation, Rea1 and dynein have their six AAA+ domains concatenated into a single gene (Garbarino and Gibbons, 2002). To analyse if there are structural similarities between Rea1 and dynein AAA+ ring geometries, we compared the Rea1 cryoEM structure to a high-resolution crystal structure of the dynein ADP state (Kon et al., 2012). The analysis revealed interesting parallels (Figure 2—figure supplement 2B). The overall appearance of the Rea1 AAA+ ring can be described as consisting of two halves adopting an ‘open’ conformation (Schmidt, 2015a). The first half is formed by modules AAA6, AAA1, and AAA2, which tightly associate because of the more closed AAA6 and AAA1 nucleotide binding sites. The second half of AAA+ modules - AAA3, AAA4 and AAA5 - is separated from the first half by the open AAA2 and AAA5 nucleotide binding sites that cause large gaps between modules AAA2/AAA3 and AAA5/AAA6. The internal arrangement of this second half is characterised by a gap between modules AAA3 and AAA4, caused by the open AAA3 site, and the rotation of module AAA4 towards module AAA5 (Figure 2—figure supplement 2B). A similar open AAA+ ring arrangement can be found for the dynein crystal structure (Schmidt, 2015a). Here, the AAA2, AAA3, and AAA4 modules form the tightly associated first half due to the closed AAA2 and AAA3 nucleotide binding sites. This first half is separated from the other AAA+ modules by gaps between AAA2/AAA1 and AAA4/AAA5 (Kon et al., 2012; Schmidt, 2015b). The second half consists of modules AAA5, AAA6, and AAA1 and its internal arrangement is highly similar to the situation in Rea1. The most N-terminal AAA+ module of this half, AAA5, is separated from AAA6 by a gap, and AAA6 is rotated towards AAA1 (Figure 2—figure supplement 2B). The dynein AAA+ ring undergoes nucleotide-dependent conformational changes that cause an open-to-closed transition (Schmidt, 2015b). The closed conformation is linked to the remodelling of two AAA+ ring extensions, the dynein linker and the coiled-coil stalk, which are involved in motor force generation and microtubule affinity regulation (Schmidt et al., 2015; Schmidt, 2015b). In order to accommodate to the closed ring conformation, the AAA6 module rotates towards the AAA+ ring centre (Schmidt et al., 2015; Schmidt, 2015b). Given the similarities in the open AAA+ ring geometries of Rea1 and dynein, especially with respect to the rotated AAA4 and AAA6 modules, it is tempting to speculate that a nucleotide-dependent open-to-closed AAA+ ring transition might also exists in the case of Rea1. The AAA+ ring linker interface is formed by the NTD, AAA6L, as well as the stem domain of the linker (Figure 3A). Within the AAA+ ring linker interface the NTD acts as a scaffold that helps to stabilise the interactions between AAA6L and the linker stem domain by contacting AAA6L-H2α and the N-terminal stem domain region, which sits like a saddle on top of the NTD. In addition to the linker stem, AAA6L also contacts the linker middle domain (Figure 3A), which is located right above the linker stem domain. One of the middle domain α-helices runs along the linker stem towards the AAA+ ring, and a peptide region at its tip contacts the loop leading to a β-sheet that packs against AAA6L (Figure 3A,B). Additional contacts exist with the loop connecting this β-sheet to AAA6L H0 and the peptide linker that connects AAA6L S5 to the linker stem domain (Figure 3A). AAA6L is the only AAA+ ring part directly contacting the Rea1 linker, which puts it in a key position for communicating ATP induced conformational changes from the AAA+ ring into the linker. Architecture of the Rea1 linker. (A) The AAA+ ring linker interface. Left panel: The N-terminal domain (NTD) acts as a scaffold between AAA6L and the linker stem via interactions with AAA6L-H2α and the N-terminal linker stem region. Right panel: Enlarged view of the AAA6L linker interactions. A β-sheet of AAA6L packs against the linker stem. AAA6L is also contacted by an α-helical extension of the linker middle domain. A short peptide region at its tip interacts with: (I) the loop leading to the AAA6L β-sheet, (II) the loop connecting this β-sheet to AAA6L H0 and (III) the loop connecting AAA6L S5 to the linker stem. (B) Linker middle domain featuring an α-helical as well as a globular extension. (C) The middle domain stabilises the architecture of the linker top. (D) Middle domain core and linker top1 interact through charged and hydrophobic residues. The interfaces between the middle domain globular extension and (E) top1, as well as (F) top3, are mainly hydrophobic. (G) Hydrophobic residues dominate the interface between top1 and top2. Top1 features a bent α-helix (yellow) and its connection to top2 is established via a long peptide region (cyan). In addition to the stem and middle domain, the Rea1 linker also comprises three α-helical bundles at its top (top1-top3) (Figure 1B,C,D). The linker emerges at an angle of roughly 120° from the AAA+ ring (Figure 1C). The 210 Å length of the complete linker fits well with the ~200 Å AAA+ ring extension that bends towards the pre-60S particle when Rea1 is bound to it (Ulbrich et al., 2009), suggesting that the linker is a key element for Rea1 tail remodelling. Previous negative stain EM studies have identified a hinge region within the Rea1 tail that is involved in its remodelling (Ulbrich et al., 2009). Comparing 2D projections of our Rea1 structure to this data suggests the pivot point area is located in the region between middle and stem domains of the linker (Figure 3—figure supplement 1A–C). The horseshoe-like arrangement of the three linker top domains is stabilised by the middle domain (Figure 3C). Its core contacts top1 via hydrophilic and hydrophobic interactions (Figure 3D) and a globular extension of the middle domain interacts with top1 and top3 via predominantly hydrophobic contacts (Figure 3E,F). Hydrophobic residues also dominate the interface between the top1 and top2 domains (Figure 3G). The various interactions of top1 hold this domain in a strained conformation as indicated by a long, bent α-helix (Figure 3C). The connection between the top1 and the top2 domains is established via an extended ~40 aa peptide region between them, which could provide flexibility during linker remodelling (Figure 3C). The top3 domain is a four α-helix bundle insertion into the linker top2 domain (Figure 1D), and it connects this domain back to the globular extension of the linker middle domain. The central role of the middle domain for the linker top architecture suggest that any conformational change in this linker part will have a major impact on the arrangement of the top domains. In order to gain insight into nucleotide-dependent Rea1 linker remodelling, we determined the Rea1 cryoEM structure in the presence of the non-hydrolysable ATP analogue AMPPNP to a resolution of 4.3 Å (Figure 4A, Figure 4—figure supplement 1A–D and Supplementary file 1). The Rea1 AMPPNP state is highly similar to the ADP state. The Rea1 ADP structure can be docked into the cryoEM density with minimal adjustments (Figure 4—figure supplement 1E). The fact that there were no significant conformational changes in the AAA+ ring compared to the ADP state reinforces our interpretation of the AAA2L-H2α insert as an auto-inhibitory element that prevents movement between the AAA+ modules of the ring. Since there was no evidence for linker remodelling in the AMPPNP state, we decided to investigate the alternative APO and ATP nucleotide states by negative stain electron microscopy. However, in these states we also did not observe linker remodelling (Figure 4—figure supplement 2A,B). CryoEM structures of the Rea1 and Rea1_ΔAAA2L-H2α AMPPNP states. (A) Front (left panel) and side (middle panel) view of the Rea1 AMPPNP state. The relative orientation of the linker with respect to the AAA+ ring has not changed. The AAA2L-H2α insert sits in the middle of the AAA+ ring (right panel), (B) Front (left panel) and side (middle panel) view of the Rea1_ΔAAA2L-H2α AMPPNP state. The angle between the linker and the AAA+ ring remains at 120°. A cryoEM density consistent with a MIDAS domain is visible above the AAA2S and AAA3S domains. The density for AAA2L-H2α has disappeared and the AAA4L-H2α insert is visible in the middle of the AAA+ ring (right panel) (C) Enlarged view of the MIDAS domain density demonstrating the fit with the integrin alpha-L MIDAS domain (purple cartoon, PDB-ID: 1T0P). Upper panel: front view, lower panel: side view. (D) Side-by-side comparison of the AAA+ rings of the Rea1 (left panel) and the Rea1_ΔAAA2L-H2α (middle and right panel) AMPPNP states. For clarity, only the AAAL domains (cartoon representation) are shown. The colour-coded outline of the AAAL positions of the Rea1 AMPPNP state (left panel) is superimposed on the AAAL positions of the Rea1_ΔAAA2L-H2α AMPPNP state (middle and right panels). For the right panel, AAA4L, and AAA5L were removed to better demonstrate the shift of AAA3L. The black arrow runs through the ring centre and indicates the direction towards the H2α insert side of the ring. Red arrows indicate the shift of the AAAL core. (E) Side view of the area marked by the grey dotted box of the right panel in (B) in transparent surface and cartoon representation. The AAA4L-H2α insert is in close proximity to the AAA5L H2 β-sheet and the AAA6L H3-S4 H2-β-sheet. We hypothesised that linker remodelling might be obscured by the auto-inhibitory AAA2L-H2α insert and carried out negative stain electron microscopy investigations on a Rea1_ΔAAA2L-H2α mutant in the APO, AMPPNP, ATP, and ADP states. Like in the case of Rea1, there was no evidence for a large scale linker remodelling event and the angle between AAA+ ring and linker remained around 120° (Figure 4—figure supplement 3A–D). Although we did not observe linker remodelling, there were noticeable differences for the AAA+ ring in case of the Rea1_ΔAAA2L-H2α mutant. In the APO and AMPPNP states, the AAA+ ring was extended by an additional EM density (Figure 4—figure supplement 3A,B). Docking the Rea1_ΔAAA2L-H2α APO structure into a recently published cryoEM structure of an Rsa4 containing Rea1-pre-60S particle complex (Barrio-Garcia et al., 2016) would place the extra AAA+ ring density directly above the N-terminal MIDO domain of Rsa4, which is known to bind to the Rea1 MIDAS domain (Ulbrich et al., 2009) (Figure 4—figure supplement 4A,B). The docking revealed that that the potential MIDAS domain density would overlap with a so far unidentified density in the Rea1-pre-60S particle map (Figure 4—figure supplement 4A,B). We hypothesised that the extra AAA+ ring density is the Rea1 MIDAS domain. To confirm our interpretation, we deleted the MIDAS domain in the ΔAAA2L-H2α background and investigated the APO and AMPPNP states of the Rea1_ΔAAA2L-H2α_ΔMIDAS double deletion mutant by negative stain electron microscopy. In support of our interpretation as the MIDAS domain, the extra density had disappeared (Figure 4—figure supplement 4C–F). In contrast to the APO and AMPPNP states, there was no evidence for MIDAS domain AAA+ ring docking in the ATP or ADP states (Figure 4—figure supplement 3C,D). In order to gain insight into the molecular basis for MIDAS domain docking, we decided to determine the cryoEM structure of the Rea1_ΔAAA2L-H2α AMPPNP state. The overall resolution of the reconstruction was 7.8 Å. The reconstruction revealed a density consistent with a MIDAS domain in-between the AAA3 and AAA4 modules, above AAA2S and AAA3S, respectively (Figure 4B,C, Figure 4—figure supplement 5A–D and Supplementary file 1). As in the case of the Rea1_ΔAAA2L-H2α APO state, docking of this structure into the Rsa4 containing pre-60S structure would place the MIDAS domain in close contact with its Rsa4 substrate (Figure 4—figure supplement 5E). Since the auto-inhibitory AAA2L-H2α insert has been deleted, the presence of AMPPNP is able to induce movements between the AAA+ modules of the AAA+ ring. Comparing the AMPPNP cryoEM structures of the Rea1_ΔAAA2L-H2α mutant and Rea1 allowed us to analyse these conformational changes and investigate how they contribute to the formation of the MIDAS domain binding site. The NTD, AAA1, AAA6 and the linker can be superimposed as a single rigid body, whereas the AAA2-AAA5 part has moved (Figure 4—figure supplement 6A). The most drastic difference is apparent for the AAA4 module. Since the AAA2L-H2α insert is no longer pushing against AAA4L, the AAA4 module is free to move towards the central pore of the ring (Figure 4D). Two rod-shaped cryoEM densities emerge from AAA4L that were not present in the Rea1 AMPPNP map. We interpret these densities as two α-helices of the previously disordered AAA4L-H2α insert (Figure 4B,E). The AAA4L-H2α insert occupies the area taken by AAA2L-H2α in the Rea1 AMPPNP map (Figure 4D). It is located in close proximity to the AAA5L H2 and AAA6L H4-S3 β-sheets (Figure 4E), which contact each other because the AAA5 module has moved towards the AAA6 module (Figure 4D). Contacts between AAA4L-H2α and the β-sheets inserts of AAA5L and AAA6L might help stabilising the movement of the AAA4 module towards the AAA+ ring centre. Another prominent conformational change is evident for the AAA3 module. It has moved around 17 Å vertically towards the H2α insert side of the AAA+ ring (Figure 4D). The consequence of the combined movements of the AAA4 and AAA3 modules is that their small domains, AAA3S and AAA2S, adopt the right orientation with respect to each other to from the MIDAS domain binding site (Figure 4—figure supplement 6B). The first Rea1 high-resolution structure has allowed us to gain important insights into the architecture and regulation of this essential molecular machine. The most prominent feature of the Rea1 AAA+ ring is the AAA2L-H2α insert that sits like a plug in the central pore of the AAA+ ring. In other AAA+ family members, such as the mitochondrial protease YME1, the disaggregase Hsp104, or the unfoldase VAT, the AAA+ ring pore interacts with their respective substrates (Gates et al., 2017; Puchades et al., 2017; Ripstein et al., 2017). Instead of binding to the Ytm1 or Rsa4 substrates, the Rea1 AAA+ ring centre hosts a structural element that regulates the ATPase activity. Its central position allows the AAA2L-H2α insert to influence all conserved Rea1 ATP hydrolysis sites in parallel. The structural and ATPase data presented here suggest that Rea1 exists in an auto-inhibited state with impaired hydrolytic activity at sites AAA2-AAA5. However, previous work has established the importance of ATP hydrolysis at these sites for yeast growth (Kawashima et al., 2016). Furthermore, the AAA3 site has also been directly implicated in Rsa4 assembly factor removal and pre-60S particle export to the cytosol (Barrio-Garcia et al., 2016). This raises the question how Rea1 might be activated to carry out its essential function. Recent studies have established that the AAA2L-H2α insert interacts with the Rix1 component of pre-60S particles to recruit Rea1 to its substrates (Barrio-Garcia et al., 2016). 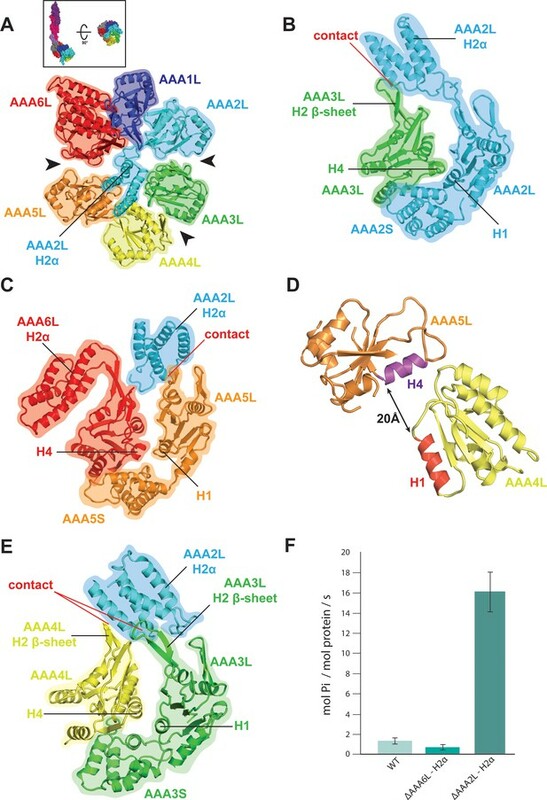 We suggest here that this binding event relocates the AAA2L-H2α insert from the AAA+ ring pore to stimulate the Rea1 ATPase activity (Figure 5). In support of this idea, a recent cryoEM structure of a Rea1-pre-60S particle complex has revealed a density extending from the Rea1 AAA+ ring centre towards Rix1 that was interpreted as the AAA2L-H2α insert (Barrio-Garcia et al., 2016). Model for Rea1 mediated Rsa4 assembly factor removal. In the absence of pre60S particles the Rea1 ATP-hydrolysis activity is inhibited by AAA2L-H2α. When Rea1 binds to pre60S particles, AAA2L-H2α relocates towards Rix1, and the Rea1 ATPase activity is stimulated. AAA2L-H2α removal allows nucleotide dependent conformational changes in the ring that cause a shift in the positions of the AAA3 and AAA4 modules and result in the recruitment of the MIDAS domain. The AAA+ ring binding site brings the MIDAS domain in close contact with its Rsa4 substrate. AAA6L of the AAA6 module has the ideal position to communicate ATP-dependent conformational changes of ring into the linker via its interface with the linker stem and the helix extension of the linker middle domain. The interface between linker stem and middle domain (black arrow head) might act as a pivot point during linker remodelling. The rearrangement of the linker during remodelling, and how it produces force to remove the Rsa4 engaged MIDAS domain from the AAA+ ring remains unknown (question mark). A key question of the Rea1 mechanism is how ATP induced conformational changes in the AAA+ ring drive the remodelling of the linker to generate force for assembly factor removal. Our analysis of the AAA+ ring – linker interface identified interactions between AAA6L, the linker stem and the helix extension of the middle domain (Figure 5). It is conceivable that a movement of AAA6L during ATP hydrolysis in the ring is transferred to the linker middle domain via the interaction between AAA6L and the middle domain helix extension. A subsequent shift in the position of the middle domain, with the linker stem as pivot point, would be suitable to disrupt the architecture of the linker top to trigger a large-scale remodelling event. We determined Rea1 and Rea1_ΔAAA2L-H2α electron microscopy structures in the APO, AMPPNP, ATP, and ADP nucleotide states to get insight into Rea1 linker remodelling. However, we were not able to observe the expected large-scale rearrangement of the linker with respect to the AAA+ ring. The relative orientation between these Rea1 parts remained essentially the same in all structures. We can only speculate about the reasons for this absence of linker remodelling. One possibility would be that linker remodelling relies on critical interactions between Rea1 and the pre-60S particle so that it can only be observed when Rea1 is bound to pre-60S particles. Evidence for this hypothesis is provided by the Rea1-pre-60S particle cryoEM structure (Barrio-Garcia et al., 2016). The AAA+ ring cryoEM density is much stronger than the linker cryoEM density. This suggests that the linker becomes flexible with respect to the ring when Rea1 is bound to pre-60S particles. Another possibility to explain the lack of alternative linker conformations are yet unidentified protein co-factors that participate in linker remodelling. Our work on the Rea1 nucleotide states revealed the existence of a MIDAS domain binding site on the AAA+ ring. At the pre-60S particle, this binding site would place the MIDAS domain in direct contact with its Rsa4 substrate. The Rea1 and Rea1_ΔAAA2L-H2α AMPPNP structures provide strong evidence for the idea that the AAA2L-H2α insert interferes with the nucleotide-dependent conformational changes of the AAA3 and AAA4 modules that create the MIDAS domain binding site. The D/E-rich region between the linker top2 domain and the MIDAS domain was not visible in our Rea1_ΔAAA2L-H2α AMPPNP map suggesting it remains flexible even when the MIDAS domain is fixed to the AAA+ ring. We observed the binding of MIDAS domain only in the APO and AMPPNP states, but not in the ATP and ADP states. This suggests that ATP hydrolysis correlates with the disappearance of the MIDAS domain binding site. When Rea1 is bound to pre-60S particles, this event might be accompanied by the removal of the Rsa4 assembly factor. The flexible D/E region between the MIDAS domain and the linker raises the question of how force can be transmitted to the MIDAS domain by a linker remodelling event. Since the Rsa4-bound MIDAS domain would be fixed on the AAA+ ring, a linker remodelling event might simply stretch the flexible D/E region and create the force for Rsa4 removal. In summary, we presented the first Rea1 high-resolution structure and revealed the intricate subdomain architecture of the Rea1 linker. The AAA2L-H2α insert inhibits Rea1 ATPase activity as well as the formation of the MIDAS domain binding site on the AAA+ ring. Rea1 is recruited to pre-60S particles through an interaction between the AAA2L-H2α insert and Rix1. This binding event might relocate the AAA2L-H2α insert from the AAA+ ring centre to Rix1. Such a relocation event would stimulate the Rea1 hydrolysis activity and allow nucleotide driven conformational changes in the AAA+ ring that lead to the formation of the MIDAS domain binding site (Figure 5). Saccharomyces cerevisiae Rea1 was amplified from genomic DNA using standard molecular biology methods. The construct was cloned into a pYES2 vector (Thermofisher) modified to introduce an N-terminal tandem Protein-A tag followed by two preScission protease cleavage sites, GFP, and two TEV protease cleavage sites. For the Rea1_ΔAAA2L-H2α and Rea1_ΔAAA6L-H2α deletion mutants, residues 692–813 or 2092–2196 were replaced by a short SG-linker. To create the Rea1_ΔAAA2L-H2α_ΔMIDAS mutant, residues 4702–4910 were deleted in addition to the residue range 692–813. Rea1 plasmids were transformed into yeast JD1370 using the Ura selection marker. For large-scale expression, 60 ml pre-cultures (2% glucose, CSM-Ura minimal medium, (Formedium)) were used to inoculate 6 × 1L expression medium (2% galactose, CSM-Ura minimal medium (Formedium)). Flasks were incubated at 30°C and 240 rpm for 12–24 hr. Cells were pelleted at 4000 rpm, resuspended in water, and flash frozen in liquid nitrogen. The frozen pellets were blended and resuspended in lysis buffer (30 mM HEPES-NaOH pH 7.4, 50 mM K-Acetate, 2 mM Mg-Acetate, 0.2 mM EGTA, 1 mM DTT, 3 mM ATP, 0.2 mM PMSF). All the following procedures were carried out at 4°C. The lysate was centrifuged at 60000 rpm for 40 min. The supernatant was collected and incubated with IgG sepharose beads (GeHealthcare) for 1 hr. Beads were washed with buffer A (50 mM HEPES-NaOH pH 7.4, 50 mM K-Acetate, 2 mM Mg-Acetate, 0.2 mM EGTA, 10% Glycerol, 100 mM KCl, 1 mM DTT, 3 mM ATP) and incubated with buffer B (50 mM TRIS-HCl pH 8.0, 150 mM K-Acetate, 2 mM Mg-Acetate, 1 mM EGTA, 10% Glycerol, 1 mM DTT). The protein was cleaved off the beads with preScission protease overnight. The flow through was combined and concentrated. The concentrated sample was loaded on a superose 6 column (GE Healthcare Life Sciences) equilibrated with buffer B. For EM grid preparation, the glycerol component of buffer B was omitted. The peak fractions were used for the ATPase assays and the EM grid preparations. For all ATPase assays, the EnzChek Phosphate Assay Kit (Molecular Probes) was used according to the recommendations of the supplier. The final reaction volume was 150 μl consisting of 30 μl 5x assay buffer (150 mM HEPES-NaOH pH 7.2, 10 mM Mg-Acetate, 5 mM EGTA, 50% Glycerol, 5 mM DTT), 30 μl MESG (EnzCheck substrate), 1.5 μl PNP (purine nucleoside phosphorylase), 10 μl Mg-ATP, and protein. The final protein concentration was 250 nM. Experiments were carried out on a GENios spectrophotometer (TECAN). The ATPase assays for Rea1 and the Rea1_ΔAAA2L-H2α deletion mutant were done in triplicate. The Rea1_ΔAAA6L-H2α ATPase assays were done in duplicate. The ATPase rates were 1.1 ± 0.13, 0.5 ± 0.1, and 16.1 ± 2.0 mol Phosphate/mol Rea1/s for Rea1, Rea1_ΔAAA6L-Hα, and Rea1_ΔAAA2L-H2α, respectively. Gel filtration fractions of Rea1 and Rea1_ΔAAA2L-H2α were diluted to 1 mg/ml using buffer B (without glycerol) and ADP or AMPPNP were added to a final concentration of 3 mM. 3 μl of sample were applied to glow-discharged holey carbon grids (Quantifoil Cu R2/2, 300-square-mesh) that were subsequently blotted for 7–8 s and flash frozen in liquid ethane using a manual plunger. All cryoEM grid preparations were carried out at 4°C. All data were collected on an FEI Titan Krios equipped with a Cs corrector and a Gatan K2-Summit detector (300 kV, 35–38 frames, 7–8 s exposure, 1.09 Å/pixel,~45–50 ē/Å2) using a slit width of 20 eV on a GIF-quantum energy filter (Gatan). All images were recorded in super-resolution counting mode using the automated data collection software Serial EM (Mastronarde, 2005) with a defocus range of 1.8 to 3.4 μm. In the case of the Rea1_ΔAAA2L-H2α AMPPNP state, a Volta phase plate was used in combination with a target defocus of 0.5 μm. The irradiated area on the VPP was changed every hour. Motion correction and dose-weighting were performed using MotionCor2 (Zheng et al., 2017). CTF parameters were estimated using Gctf (Zhang, 2016). Subsequent processing was done using Relion-2.0 (Kimanius et al., 2016) unless stated otherwise. Micrographs were first manually examined to remove images with significant uncorrected drift, large amount of contamination, a large astigmatism, extreme defocus values (<1.2 μm or >5 μm), or abnormal Fourier patterns. Micrograph quality evaluation in the case of the Rea1_ΔAAA2L-H2α AMPPNP phase plate data set was done according to von Loeffelholz et al. (2018). For the Rea1 ADP dataset a small set of particles was manually picked and subjected to reference-free 2D classification. A selection of 2D class averages representing different views of Rea1 was selected, centred using the Relion shift_com function, and used as references for autopicking by Gautomatch (K. Zhang, MRC Laboratory of Molecular Biology, Cambridge, UK). Autopicked particles were cleaned by several cycles of 2D classification. Subsequently, cleaned particles were subjected to 3D refinement. The initial Rea1 model was obtained using the ab-initio modelling function as implemented in Relion 2.1. The output X and Y origin information of the 3D refinement was used to obtain more accurate coordinates of the particles. The re-centred particles were subjected to another round of 3D refinement. The obtained map was divided into two parts covering the Rea1 linker region and the NTD-AAA+ ring region. We conducted focused 3D classification and 3D refinement of these individual parts as described (Nguyen et al., 2016). The final reconstructions of the NTD-AAA+ ring region and the linker were based on 35671 and 432556 particles, respectively. To aid the interpretation of the obtained maps, sharpening was carried out by applying a negative B-factor that was either estimated using automated procedures within Relion or manually set parameters. The Rea1 AMPPNP state was also reconstructed with Relion 2.1. The Rea1 ADP state map was low pass filtered and used as an initial reference for the first 3D refinement step. Particles were aligned using the output of the initial refinement as a reference followed by a focused refinement of the Rea1 linker part. The subsequent 3D classification was performed post alignment using a large elliptic featureless mask encompassing the Rea1 AAA+ ring to evaluate potential movement between the linker and the AAA+ ring. In all analysed classes, the linker-AAA+ ring angle remained around 120°. The final Rea1 AMPPNP map was reconstructed from a class with 55442 particles. The Rea1_ΔAAA2L-H2α AMPPNP data set was processed with Relion 3.0 using standard procedures including ab-initio reference building by Stochastic Gradient Descent. The final Rea1_ΔAAA2L-H2α AMPPNP map was reconstructed from 20724 particles. All model buildings were done in Coot (Emsley and Cowtan, 2004). In the case of the NTD-AAA+ ring of the Rea1 ADP map, polyalanine models of the dynein AAA1L and AAA1S domains (PDB-ID: 4RH7) were initially docked into the AAA+ ring and subsequently modified according to the quality of the map. Other parts of this map were built by placing standardised α-helices and tracing the main-chain between them. Occasionally bulkier side-chains were visible that were included in the final model. The quality of the Rea1 linker map allowed de-novo building of a side-chain model. Phenix real space refine was used to refine the NTD-AAA+ ring and the linker model (Adams et al., 2010). To create the Rea1 ADP AAA+ ring – linker composite model, both structures were aligned on the stem domain which was visible in both maps. For the Rea1 AMPPNP model, the Rea1 ADP model was split into the NTD-AAA+ ring linker stem and linker middle domain – linker top regions. Both regions were docked into the Rea1 AMPPNP map as two separate rigid-bodies. This initial docking already led to a close fit. Minimal rigid body fit adjustments were done for the AAA2, AAA3, AAA4, and AAA5 modules of the AAA+ ring. To create the Rea1_ΔAAA2L-H2α AMPPNP model, the NTD, the AAA1, and AAA6 modules, as well as the complete linker of the Rea1 ADP structure, were docked as a single rigid body into the Rea1_ΔAAA2L-H2α AMPPNP map. The AAA2, AAA3, AAA4, and AAA5 modules of the Rea1 ADP structure were docked as individual rigid bodies into the Rea1_ΔAAA2L-H2α AMPPNP map. All figures were prepared in Pymol (The PyMOL Molecular Graphics System, Version 1.2r3pre, Schrödinger, LLC) or Chimera (Pettersen et al., 2004). The programme Eman2 (Tang et al., 2007) was used for 2D projections. Rea1 or the Rea1_ΔAAA2L-H2α deletion mutant in buffer B without glycerol were diluted to a final concentration of 45 nM. AMPPNP, ATP, or ADP were added to reach a final concentration of 3 mM. Negative-stain electron microscopy was performed on plasma-cleaned carbon film on 400-square-mesh copper grids (Electron Microscopy Sciences). 3 μl sample was applied to the grids that were subsequently stained with 2% (w/v) uranyl acetate. Data collection was done on an FEI tecnai G2 operated at 200kV and equipped with a Gatan Ultrascan 2K*2K CCD camera. Data were collected at ∼1 μm underfocus, with a pixel size of 3.629 Å and an estimated dose of 25 electrons / Å2 during 1 s exposures. SerialEM was used for semiautomatic data acquisition. Around 8000 particles per data set were manually picked and processed with Relion using standard procedures. In order to not bias the orientation of the linker with respect to the AAA+ ring, the initial model consisted of the low pass filtered NTD-AAA+ ring map rescaled to the correct pixel size. The atomic coordinates for the Rea1 AAA+ ring and the Rea1 linker in the ADP state have been deposited with PDB IDs 6HYP and 6HYD, respectively. The accession codes for the Rea1 and Rea1_ΔAAA2L-H2α models in the AMPPNP state are 6I26 and 6I27, respectively. The accession codes for the cryoEM maps of the Rea1 AAA +ring and the Rea1 linker in the ADP state are EMD-0309 and EMD-0308, respectively. The accession code for the unsharpened cryoEM map of the Rea1 AAA +ring in the ADP state is EMD-0330. The cryoEM maps of the Rea1 and Rea1_ΔAAA2L-H2α AMPPNP states have the EMD accession codes EMD-0328 and EMD-0329, respectively. The Journal of Cell Biology 207:481–498. Nature Structural & Molecular Biology 19:1234–1241. Biochimica Et Biophysica Acta (BBA) - Molecular Cell Research 1823:92–100. Proteins: Structure, Function, and Genetics 42:38–48. Molecular Biology of the Cell 19:2844–2856. Journal of Cell Science 126:4815–4821. Journal of Structural Biology 202:191–199. Biochimica Et Biophysica Acta (BBA) - Molecular Cell Research 1823:2–14. Thank you for submitting your article "The CryoEM Structure of the Ribosome Maturation Factor Rea1" for consideration by eLife. Your article has been reviewed by three peer reviewers, one of whom is a member of our Board of Reviewing Editors, and the evaluation has been overseen by Andrea Musacchio as the Senior Editor. The reviewers have opted to remain anonymous. The study presented by Sosnowski and Urnavicius et al. reports the first atomistic model of the Rae1 ribosome assembly factor. Rae1 belongs to the AAA family of AAA ATPase and participates in the remodeling of the large ribosomal subunit by removing several smaller associated factors during 60S biogenesis. While the importance of Rae1 in this pathway is clearly established, the molecular mechanism of these remodeling reactions is still poorly understood in large part because of a lack of structural information on the Rae1 AAA ATPase. 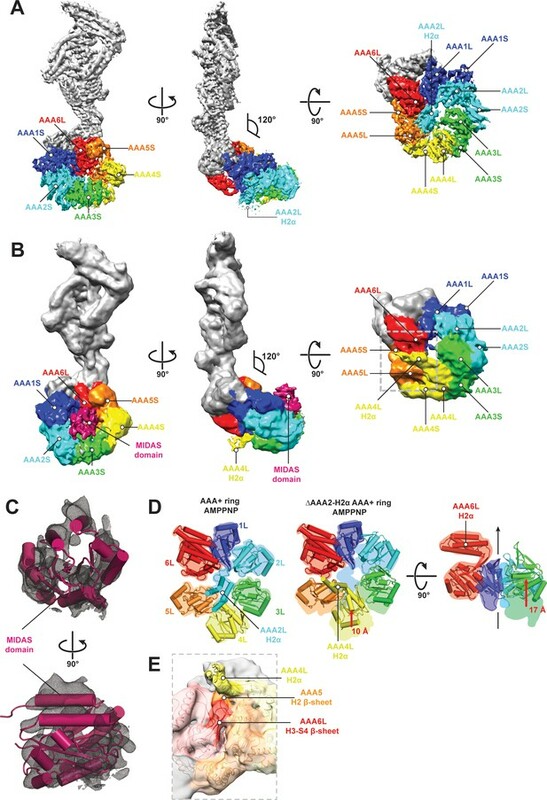 This study presents the cryo-EM structure of S. cerevisiae Rae1, which reveals several novel structural features for this AAA ATPase and attempts to present a plausible mechanism for its removal of effectors from the ribosome through the MIDAS domain that is disordered and not visible in this structure. This is a straightforward structure paper that will no doubt catalyze interesting mechanistic studies and it should be published. - The manuscript is surprisingly lacking in any validation of the structure. None of the standard metrics in the field have been reported. The authors should provide the following: FSC (gold standard) curves for all refinements; FSC (model-to-map) for their final models; maps showing local resolution; locally-filtered maps (is the map in Figure 1—figure supplement 1 locally-filtered? ); table with MolProbity scores and Ramachandran statistics. (Although the authors did submit a PDB validation report, these statistics need to be in the manuscript itself.) Since the final model is a composite of structures that were refined separately, these statistics should be reported for each structure. Similarly, a table (or tables) with data collection and refinement statistics should be included as a supplementary figure. It is not sufficient to include this information in the Materials and methods. - In Materials and methods it is stated that the authors used a total electron dose of 6.6 electrons/A2 ? This seems low. Can the authors check or comment? - In terms of interpretation of the structure, the authors find that AAA6-AAA1 and AAA1-AAA2 interfaces are in the closed conformation. Most often, AAA+ motors only adopt a closed configuration in the ATP state, as the arg finger from the adjacent subunit contacts the ATP γ-phosphate. In the absence of the γ-phosphate, We would expect that the interfaces would resemble the post-hydrolysis 'open' state. It is interesting that these are the two sites that are expected to be incompetent for ATP hydrolysis. We feel that the authors should comment on this unexpected finding. - Given the parallels between Rae1 and dynein, the authors should include a structural comparison between these proteins in their Discussion. - The significance of the nucleotide state of the structure is unclear. Why was the structure solved in the presence of ADP? Since AAA1 and AAA6 lack the catalytic residue in the Walker B motif, isn't the expectation that in vivo these two subunits are always bound to ATP, not ADP (as in the reconstruction)? Can the authors comment on this? Do they have any information on an ATP bound state? What was the reason for assembling Rea1 complex in excess ADP and not ATP? What functional state do the authors think their complex represents? - The structure should reveal insights into the mechanism of Rea1 activity. Unfortunately, the mechanism proposed in the current manuscript is too opaque. Figure 4 should summarize the findings and indicate the authors' proposal for how Rea1 modifies the pre-60S ribosome structure. The figure does have a small conformational change that the authors propose is important for regulating ATPase activity. While this regulation is of moderate interest, this was not convincingly shown. We would hope that the structure would lead to more insights than simply 'AAA+ communicates with the linker segment' which was not a new insight. In fact, the figure shows no conformational change in this segment despite the authors spending much time in Figure 3—figure supplement 1 discussing how the ATPase activity drives conformational changes in the linker. The section describing these conformational changes was confusing and not very informative. The authors allude to a conformational change at the AAA+/stem connection, but don't describe their thoughts cogently. Alternatively, it seemed as if the authors were proposing that the Top domains may move in a ball-in-socket fashion around the middle/stem regions. Furthermore, Figure 4 makes it appear that there is no conformational change in the linker segment, which was confusing considering the discussion of conformational change. What exactly are the authors proposing for the Ytm1/Rsa4 removal mechanism? - Given the length of the flexible D/E rich region (over 600 residues), what is the mechanism of force transmission through the MIDAS domain, which is the one that binds to the substrate? Wouldn't the length and low complexity of the D/E region allow the MIDAS domain to freely interact with its substrate anyway without needing the motion of the linker? - The authors should present some data from experiments testing their mechanistic model. The reviewers agreed that it should be possible to make structural predictions about the transmission of conformational changes from the motor to the linker. These could be either functional assays, or some type of EM that shows that conformational changes the model predicts do take place. This has been done. We now provide gold standard FSC curves for the refinements, model-to-map FSC’s of the structural models as well as local resolution maps for the Rea1 ADP AAA+ ring and linker maps (Figure 1—figure supplement 1), the Rea1 AMPPNP map (Figure 4—figure supplement 1) and the Rea1_ΔAAA2L-H2α AMPPNP map (Figure 4—figure supplement 5). MolProbity scores and Ramachandran statistics for the AAA+ ring and linker models are provided in Supplementary file 1. We don’t report these values for the Rea1 AMPPNP and Rea1_ΔAAA2L-H2α AMPPNP structures, because they were created via rigid-body docking of the Rea1 ADP structures. CryoEM data collection statistics are also provided in Supplementary file 1. This has been corrected. We accidentally reported the dose per second and not the total dose. The total dose varied between 45 and 50 electrons/A2 for the three data sets reported here. We have corrected this in the Materials and methods section and also report these values in Supplementary file 1. This has been done. We now discuss the degree of the closure of the Rea1 AAA1 and AAA6 nucleotide binding sites in the section”Structure of the Rea1 AAA+ ring”. We compare the Rea1 AAA1 and AAA6 sites to closed and more open AAA sites in the Rea1 related dynein motor. This has been done. We have now included a section entitled “Comparison of the Rea1 and dynein AAA+ rings” analysing the similarities between both proteins. In this paragraph we point out that the geometry of the Rea1 AAA+ ring closely resembles the dynein AAA+ ring in the ADP state. The geometry of the rings can be roughly described as two halves of three domains each. In one half, the AAA+ domains are more tightly associated. In the other half they are more loosely packed. In both cases the loosely packed half of the AAA+ ring features a central AAA+ domain that is rotated with respect to the other domains. 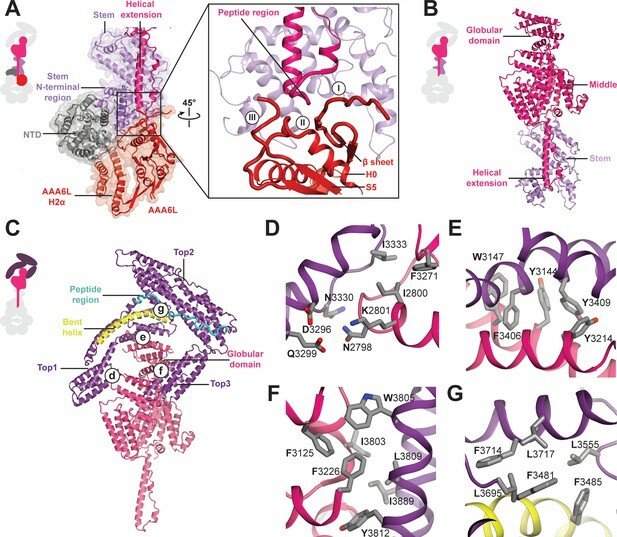 We initially focused on the Rea1 ADP state because one of the first high-resolution crystal structures of the Rea1 related dynein motor was obtained in the presence of ADP (Kon et al., 2012). We hypothesised that ADP might also have a stabilizing effect on Rea1 so that a potentially higher resolution might be achieved compared to other nucleotide states. We did not choose ATP because we suspected that ongoing ATP hydrolysis in our sample would introduce additional conformational heterogeneity that would lower our chances of obtaining a high-resolution cryoEM reconstruction of Rea1. Concerning the nucleotide states of AAA1 and AAA6, we tried to fit ATP instead of ADP. However, there was not enough space for the γ-phosphate. The cryoEM structure was also obtained in the presence of 3 mM ADP which makes it likely that the observed nucleotide is ADP. We now provide additional cryoEM structures of the AMPPNP state for wildtype Rea1 and a mutant where the AAA2L-H2α insert (the central “plug” of the ring) has been deleted. In line with our original proposal of AAA2L-H2α as auto-inhibitory regulator, these structures now clearly demonstrate that important nucleotide dependent conformational rearrangements of the ring only take place when AAA2L-H2α is not present at its center. The Rea1 ADP structure in the original manuscript as well as the additional Rea1 AMPPNP in the revised version represent the identical, auto-inhibited Rea1 state. In order to better distinguish between the structural description of Rea1 and our ideas about the Rea1 mechanism, we have split “Results and Discussion” of the original manuscript in two separate “Results” and “Discussion” sections in the revised version. In our new “The AAA+ ring – linker interface and the structure of the Rea1 linker” paragraph of the Results section we now simply describe our findings about the structural elements that make up the AAA+ ring – linker interface and point out the architecture of the linker. We have removed the speculative parts about movements and interactions of AAA+ domains AAA6, AAA1, AAA5 as well as AAA2-AAA4 and how these might introduce linker remodelling from the “Discussion” section of the revised version. We now simply remind the reader that AAA6 is the only AAA+ domain that directly contacts the linker via interactions with the linker stem and the helix extension of the middle domain, which are completely new insights that were not obvious from previous work. We go on to briefly point out that a potential movement of AAA6 during ATP hydrolysis in the ring could be transferred to the linker middle domain via the interaction between AAA6 and the helix extension of the middle domain. A conformational shift of the middle domain might trigger a large scale remodelling event given the importance of the middle domain for the architecture of the linker top. We also clearly state that we did not observe such an event despite testing various nucleotide states of Rea1 and the Rea1_ΔAAA2L-H2α mutant and discuss potential reasons for this unexpected finding. We also added the additional aspect of the AAA+ ring MIDAS domain binding site to our Discussion. We provide strong evidence that this binding site would place the MIDAS domain in direct contact with the Rsa4 substrate when Rea1 is bound to pre60S particles and that the formation of the MIDAS domain binding site is controlled by the auto-inhibitory AAA2L-H2α insert. We believe that these findings provide important additional insights into the Rea1 mechanism and that they have significantly strengthened our manuscript. We discuss this issue now in the “Discussion” section of our revised manuscript. Since the MIDAS domains is fixed at the Rea1 AAA+ ring when it binds to its Rsa4 substrate, a linker remodelling event might simply stretch the flexible D/E region to transmit the force for Rsa4 removal to the MIDAS domain. stain electron microscopy structures of the Rea1_ΔAAA2L-H2α APO, AMPPNP, ATP and ADP states. Furthermore, we also determined a cryoEM structure of the Rea1_ΔAAA2L-H2α AMPPNP state. In all these cases we did not observe Rea1 linker remodelling. These results strongly suggest that linker remodelling on isolated Rea1 molecules cannot be induced by simply adding different nucleotides. Rea1 behaves clearly differently from the related dynein motor, where linker remodelling correlates with defined nucleotide states. In the case of Rea1, additional factors seem to be needed to induce such an event. One such potential factor could be the pre60S particle that might provide important interactions for Rea1 linker remodelling. Since the conditions under which linker remodelling occurs could not be identified, it is at the moment impossible to evaluate the effect of mutations. Even if we would observe nucleotide dependent linker remodelling in a mutant, we would not be able to distinguish if such an event is physiological or an artefact. We gratefully acknowledge Julio Ortiz and Tat Cheung Cheng for their help during cryoEM data collection. This research was supported by ATIP-avenir (CDP-0B1INSB-HS9ADO1051) as well as LabEx start up (ANR-10-LABEX-30-HS) grants to HS and a Region Grand Est jeunes chercheurs fellowship to PS. HS also acknowledges the support of the MRC Laboratory of Molecular Biology during the initial stages of the project. This study was further supported by the grant ANR-10-LABX-0030-INRT, a French State fund managed by the Agence Nationale de la Recherche under the frame program Investissements d’Avenir ANR-10-IDEX-0002–02. The authors acknowledge the support and the use of resources of the French Infrastructure for Integrated Structural Biology (FRISBI) ANR-10-INBS-05 and of Instruct-ERIC. We thank Andrew Carter, Patrick Schultz, Albert Weixlbaumer, Alastair McEwen and Sandrine Morlot for their invaluable comments on the manuscript. © 2018, Sosnowski et al.